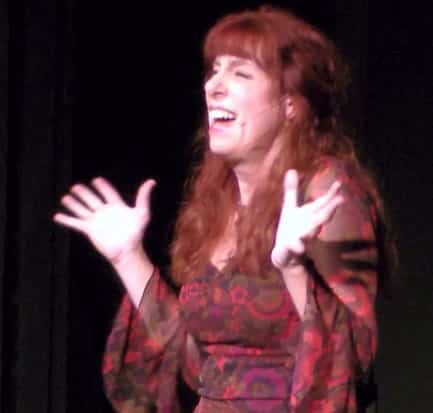 With an eclectic background as a vocalist and musician on both coasts and in Eastern Europe since the late 1970s, Eva Moon has been writing and performing her original music and theatrical works around the Pacific Northwest since 2002. Far from typical singer-songwriter fare, her compositions are ironic, energetic commentaries on modern life. Her original solo shows include 7 Deadly Sins and Me which had a nine-month run in Seattle, My Perfect Life and Other Delusions, Eva Moon’s Stimulus Package, The Deal With It Cabaret (all performed with her band, Eva Moon & the Lunatics) and The Mutant Diaries: Unzipping My Genes, her first entirely solo show, now available streaming or on DVD from Amazon. From there she moved on to the musical play First You Jump and most recently, The Home for Dead Fairytale Mothers. She has released five CDs and her work has appeared in the movie soundtracks of You May Not Kiss the Bride (directed by Rob Hedden, 2011) and Plunder (directed by Danny Schechter, 2009). Eva sings in fifteen different languages, including English. Though she still enjoys performing live and speaking at conferences, more recently, Eva has divided her energies between playwriting and screenwriting, with both short and full-length plays and musicals staged across the U.S. and in the U.K. Her award-winning feature screenplay, HOUSE ODDS, has been optioned.